I love history! I love old stuff! I love old maps! I love looking at old things! So when @Goob tweeted this link to “Old Maps Online,” I got sucked into a wormhole for several hours looking at maps of Pittsburgh from the late 1700s and 1800s. Click the pics for embiggens and click the links to go to the maps to explore them for yourself. 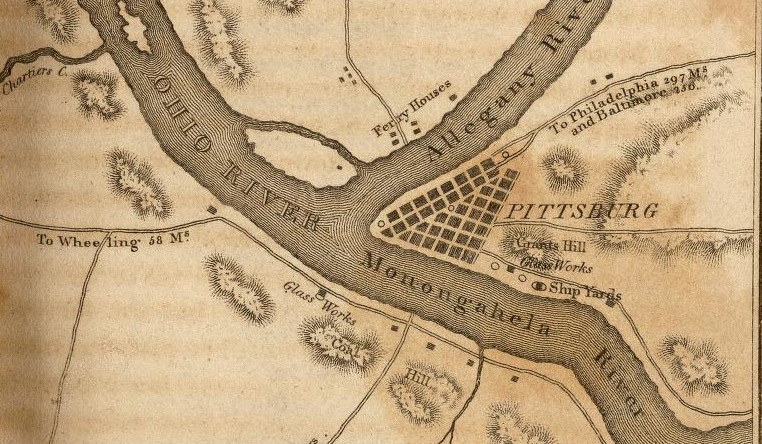 Here’s Pittsburgh in 1796 (Composite of) A General Map Of The River Ohio, From its source to its mounth (sic). I love how the cartographer indicates all along the river where it becomes dangerous. I wish he would have written, “Here be dragons.” I’ve also circled where the buried treasure is. DIBS! Also, it looks like McKeesport comes from M. Kee’s Port. Who knew?! Here’s Pittsburgh in 1872 Map of the cities of Pittsburgh, Allegheny and the adjoining boroughs. Love that all the streets are named including the bridges! Click for the embiggen, but then also go look at this map and hunt around. Bridges I see are the Hand St. Bridge, Allegheny Suspension Bridge, the Mechanic Street Bridge, and the Monongahela Suspension Bridge. Birmingham Bridge too! Here’s Pittsburg in 1895 General topographical map. Sheet V. Julius Bien & Co., Lith., N.Y. I love it all! I like how some of the towns in that one are possessive. Larimer’s. Irwin’s. Stewart’s. Now I’m off to see about that buried treasure at the bottom of the Mon. Who wants to be my Goonies? The ones before 1877, by which time the hot-air balloon had been invented, you know somebody had to get up in a flying saucer to be able to see that degree of detail. I’m guessing it was Rick Sebak. Doubt me at your peril. That’s actually a pretty good point! I like how the Parkway West is already laid out on the 1796 map. If you look closely, you can see the conestoga wagons backing up at the entrance to the Fort Pitt tunnel. HA! That comment just made me spit out my drink. That’s too funny. That’s even funnier if you say it to yourself in a pirate voice, arrr. Also, these are cool. I too love me some old maps. I’m also the guy who reads every little card in the museum, which explains why I’m always running to catch up with everyone else. And why Mrs. Daddy won’t go to museums with me. Oh, me too! Along with the blue commonwealth placards noting historical events and locations. I always stop to read those and then have to run to catch up. I hate when we’re in the car and can’t stop to read one! Virginia! – No comment on the one map that says “PITTSBURG”? The “H” has been an off-and-on thing through history. Yeah…I know the “h” was officially dropped for awhile at the end of the 19th century, but obviously that wouldn’t include 1812. Maybe they were under an h shortage, what with the war and all. The H was gone from 1890-1911 and the city was chartered in 1816 as Pittsburgh WITH an H, but the printed copies of the charter at that time excluded the H erroneously, which would explain the 1812 map. I grew up in Murrysville. “Murraysville” was an acceptable spelling for years. It was named after the Murray family, but apparently that “a” was too much for the masses to handle. I like how a large portion of the south hills was called “Lower Saint Clair”. Thanks for the diversion from work! These are great! I have a serious obsession with maps, especially old ones like these. I like to see how people would get from Point A to Point B back in the day. I can easily see how you could get lost in these links for hours. The City Engineer has black and white low altitude, low angle stereoscopic photos of the City and some near suburbs from the 1930s and/or 1940s that were used for mapping. They are phenomenal! How did they take pictures through all the smoke? John McKee, an original settler of Philadelphia and son of David McKee, built a log cabin near the confluence of the Monongahela and Youghiogheny rivers, the site of present-day McKeesport. After taking over his father’s local river ferry business, he devised a plan for a city to be called McKee’s Port. John set out his proposal in the Pittsburgh Gazette, as part of a program under which new residents could purchase plots of land for $20.00 (a lottery was the means to distribute the plots to avoid complaints from new land owners concerning “inferior” locations). For all the map lovers out there, here is a great site to look at old historic maps of the city and region: http://digital.library.pitt.edu/maps/ And, they do make great artwork!